There’s no replacement for displacement,” goes the adage. However, this may no longer true considering the kind of horsepower being pumped out of today’s boosted engines. Whether you’re building engines for stock, performance or a diesel application, chances are you’ll be working with an engine that is boosted sooner or later. Choosing one power adder over another more likely has more to do with customer preference than what produces the most power. The popularity of power adders has increased in recent years, partly because the OEMs are also employing this technology to boost the output of their production engines to make them more efficient. Drivers are becoming more familiar with these components because of this growing trend of downsizing – where a larger, naturally aspirated engine gets swapped for a smaller, turbocharged engine. This is a Procharged 454 cid LSX engine built by Patterson-Elite Performance. This engine is producing more than 1,300 horsepower. While Americans have had a love affair with the V8 engine ever since the first Ford Flathead was introduced, this may be changing, in part, because power adders are more accepted now and the technology to control them has improved. On the race track, superchargers and nitrous have been a mainstay in drag racing for decades. Indycars and Formula One have gone back to turbocharged powerplants, and sports cars are also running a variety of engine configurations that lean heavily on new technology such as turbochargers and even hybrid power. Simply put, larger engines flow more air, so they produce more power. If you want a smaller engine to perform like a big engine, or make a big engine produce even more power, you will need to draw more air into the cylinder. How you do this varies on what type of power adder you’re using. The following are some of the ways engine builders are “powering” up. Forced induction dates back more than 100 years when Gottlieb Daimler patented the technique of using a gear-driven pump to force air into his internal combustion engine in 1885. 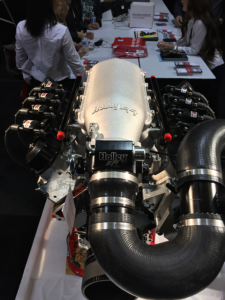 Fast forward to 2018, and engine builders are using twin-turbo setups to pump out up to 3,000 horsepower in some applications. We see street builds of 1,000 horsepower or more on a frequent basis. 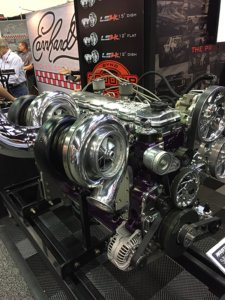 One engine builder we spoke to said that turbochargers have gotten a lot more popular over the last few years because of the growth in EFI technology and builders being more comfortable with tuning them. Turbos offer more potential than superchargers because they can make more power over a broader torque range. However, adding a turbo to an engine build also adds significant cost. There are several kits available for superchargers and nitrous, with nitrous being the most affordable of the options for add-on power. 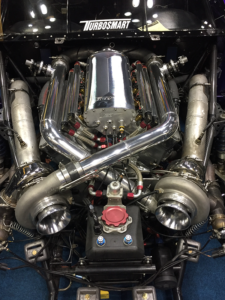 This is Steve Morris Engines’ in-house built V16 engine dubbed the Devel Sixteen featuring quad turbochargers. It can pump out nearly 5,000 horsepower. Now that’s some added power! One crankshaft supplier we spoke to said that a big problem that drag racers are having with turbo cars is that racers load the engines up to get the turbo spooled at the start line and it puts a lot of pressure on the thrust bearings. He says that some engine builders are preventing seized up thrust bearings by using a Torrington bearing instead. These are wafer style roller bearings that are not meant to last for long runs; however, for drag racing, it is a good solution for a 1/4 mile at a time. Turbocharging is more expensive up front and can add $4,000-$10,000 to a build or more. However, the benefits of a turbo are many. For one, engines can make more power with a smaller displacement and less stress on the internals than a larger, naturally aspirated engine. It is not uncommon for turbocharged engines to produce big horsepower and still get reasonable fuel mileage on pump gas, which makes them attractive options to street performance customers. The layout of the turbocharger setup for a particular application is vital for the system to perform correctly. Intake and exhaust plumbing is often at the mercy of engine bay packaging constraints. Turbo sizing is also a consideration for engine builders. Depending on the application, whether for street or racetrack, the Area/Radius is an important factor. Performance of the turbo is affected by changing the A/R of the housing, which adjusts the flow capability. A smaller A/R increases the velocity of the exhaust gas, making more power at lower rpm and quicker spooling of the turbo means less lag time. But a turbo with a smaller A/R will not flow as much at high rpm. Using a larger A/R lowers exhaust gas velocity, and creates lag at lower speeds but produces better power at higher engine speeds. When deciding between A/R options, experts recommend selecting a turbo setup (whether it’s one or two) for the desired powerband. Twin turbos can offer an advantage since one turbo can be dedicated to low speed and the other to high-speed boost optimization. A big problem drag racers are having with turbo cars is loading the engines up to get the turbo spooled at the start line. This puts a lot of pressure on the thrust bearings and can cause them to sieze. Some engine builders are using a Torrington bearing instead. These roller bearings are not meant to last for long runs, but, for drag racing, it is a good solution for a 1/4 mile at a time. According to one expert, superchargers are the way to go because they are not as complicated to install as a turbo setup with all of the plumbing that’s necessary. So tuning them is also more straightforward. You don’t have to worry about wastegates and other things that are more complicated on turbo applications. 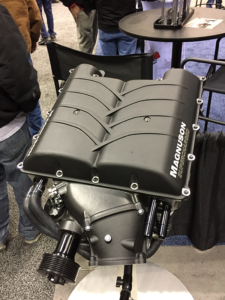 For LS and Coyote applications, there are supercharger kits available from many aftermarket sources and are good options for off-the-shelf builds, but where it gets more complicated, is when you go to a big block or something similar where you have to worry about fitting it all under the hood without having a big bubble to cover it. Supercharging is generally the way to go if your customer wants instant throttle response. A supercharger is a belt-driven blower so it is less efficient than a turbo because it uses power from the engine to drive the blower. A Roots style blower like those on street rods and Top Fuel dragsters, uses lobed rotors that rotate to force air into the engine. The boost pressure developed depends on engine speed and the underdrive ratio of the pulley on the supercharger. A centrifugal supercharger does not have counterrotating rotors, but uses a compressor design similar to the impeller wheel on a turbocharger. Boost builds with rpm more like a turbo, but throttle response is better because of the belt-drive setup. Superchargers are also great options for power adders as they offer instant throttle response and aren’t as complex to install as turbochargers can be. Superchargers are also easier to tune because you don’t have to worry about wastegates and boost controllers. It’s basically picking your pulley setup and controlling your bypass valve to limit the boost. In some cases you don’t have to even worry about that because you can get 12-13 lbs. right out of the box with some of the kits that are available. One advantage to a Roots-style supercharger is not having to deal with all of the plumbing. For most street performance customers, this is a good solution. One crankshaft manufacturer we spoke to said that their big block 4.25˝ crank used to be the most popular crank for a while and then engine builders found out that they could go to the 4.75˝ for a 632 cid big block. 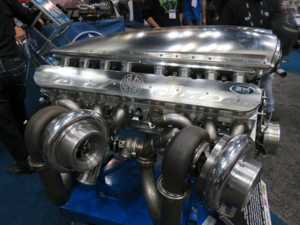 Now with the popularity of superchargers, he says that customers are starting to go back to the 4.25˝ crank to build a 540 cid big block with a supercharger added on to make up the power difference. When one turbocharger isn’t enough, you can always add more. 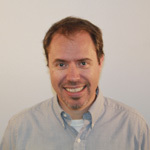 is, in part, due to the computer controlled systems and some other tools that help control the engine and give it what it needs. Years ago, it was a lot more difficult to control a supercharged application with a carburetor. Carburetors were meant to work with vacuum, not under pressure, so when you introduced charged air, the fuel and air would leak like a sprinkler if everything wasn’t exactly right. With today’s EFI engines, you can tune a lot more accurately using airspeed density or manifold absolute pressure. In street applications, engine builders go by mass air flow sensor readings. With manifold absolute pressure, you’re looking at engine rpm and picking your fueling targets ahead of time as to what you choose as the optimal air-fuel ratio. Then you adjust the fueling accordingly to hit your target as close as possible. The closer you are to the target, the less delay there is from the closed loop wideband oxygen sensors. Nitrous can add some serious power to an engine. 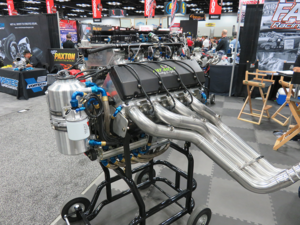 Pat Musi Racing Engines was at the forefront of nitrous engines when they brought it to the tracks of Pro Modified Drag Racing years ago. If your customers are on a budget and only looking to add 100 hp or so to an otherwise stock LS build, for example, nitrous can accomplish this for less than $1,000. Your customer may not want to spend the money on a turbo system that can cost several times more up front. But when you’re adding big horsepower, nitrous gets expensive because it is harder on parts. Everything will need to be beefed up to handle the loads. Of all the power adders available, nitrous is the least expensive and easiest to install. Nitrous oxide increases the density of the air entering the cylinder. Nitrous can be a safe, reliable horsepower booster, but adding a big shot of nitrous can be disastrous on internal engine components. It is the most violent of the “power adders” because of the chemical reaction involved. However, since it is the most affordable of the types it will always be in favor with some racers and enthusiasts. The layout of the turbocharger setup for a particular application is vital for the system to perform correctly. Intake and exhaust plumbing is often at the mercy of engine bay packaging constraints. Turbo sizing is also a consideration for engine builders. The key to building engines with power adders, according to our experts, is to find out what your customers’ goals are for the project. If they don’t know what they want, show them some options. Do they want to make a lot more power down the road or is adding a few extra ponies enough? It is better to find out up front what the long-term plan is because you may need to build it in stages and be prepared for a bigger add-on later. 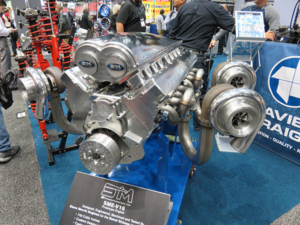 A rule of thumb for upgrading internal components in boosted engines is this: at about 600 horsepower with a small block or 800 horsepower with a big block, you will likely need beefed up components. Forged pistons, steel top rings, stronger connecting rods and a forged steel crankshaft may be necessary to handle the increased loads. More cooling capacity also becomes vital. A high flow water pump, more efficient cooling fan and an aluminum radiator may also be necessary to keep the engine and your customer in their happy place. Go ahead – give it all you got.